Monthly updates had already braced shareholders for lower funds under management — which in turn reduced first-half profit by 21%. Tough markets have again prompted the fund manager to cut its projections, as fee rates are trimmed and costs creep higher. As before, significant new clients are required to bolster earnings and support a decisive share-price re-rating. I am hopeful the replacement chief executive might one day re-energise the group’s marketing. The accounts remain cash-rich and high-margin, and the shares yield 7.5%. I continue to hold. CLIG took just ten working days to construct these summary interim accounts. I wish all quoted companies could be as timely when presenting their financials. Note that CLIG’s RNS did not reveal all of the numbers. The group’s website published a City presentation, which included some detailed figures as well as various charts and other stats. CLIG’s first-quarter statement and subsequent website updates for October, November and December had already signalled these figures would not be fantastic. In the event, the presentation confirmed funds under management (FUM) at the end of December had declined $482m, or 9%, to $4,625m since the June year-end. The FUM drop was split $99m during Q1 and $383m during Q2. Half-year revenue fell 9% and in turn thumped pre-tax profit by 21%. Administrative expenses (which are mostly employee costs) increased by £0.4m and amplified the profit shortfall. Earnings came in at 16.3p per share, which annualised would give 32.6p per share. My valuation sums (see later) indicate earnings could now be running at approximately 29p per share. Of the aforementioned $482m FUM decline, a net $42m was due to client withdrawals. I have created three tables to show CLIG’s FUM movements in greater detail. The Emerging Market division has consistently lost FUM during the last four quarters. 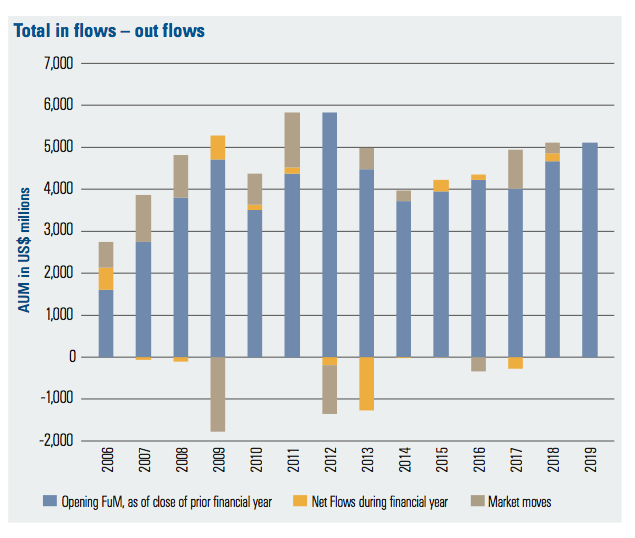 Money continues to trickle out of Emerging Markets, and continues to trickle in to non-Emerging Markets. The last quarter witnessed CLIG’s Emerging Market funds suffer another notable downturn and the non-Emerging Market investments endure by far their worst quarter of the twelve months. I note CLIG’s 9% FUM dive was at the top end of the group’s 4% to 9% benchmark drops. My tables suggest the Emerging Market funds fell an underlying 6% versus a reported benchmark decline of 8%. 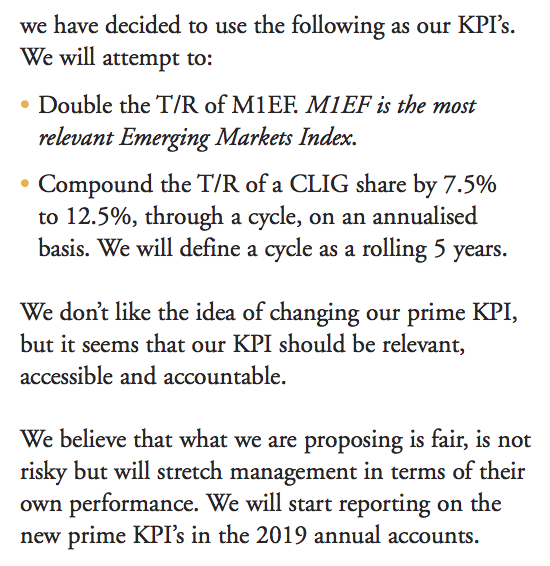 You may recall I mentioned within my August write-up that CLIG’s representative Emerging Market fund was on course for lagging its benchmark for three consecutive (calendar) years. Enjoy my Blog posts through an occasional e-mail newsletter. Click here for details. I counted 169 clients now onboard versus 158 at this time last year. During 2015, 2016 and 2017, client numbers bobbed consistently around the 155 mark, so I am pleased some progress was made attracting new customers during 2018. True, the 24 new clients who joined during 2018 hold an average FUM of just $15m each (versus, say, the c$250m average from the three clients gained during 2014). However, I would like to think more FUM could be added from these new customers if CLIG’s funds do well. In fact, CLIG claimed a further $125m of FUM would be funded during the current quarter. 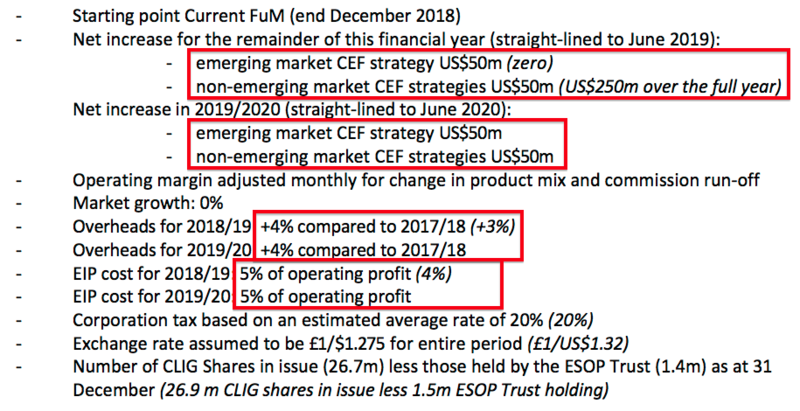 Mind you, I still feel CLIG’s wider FUM progress is dictated mostly by general market movements. 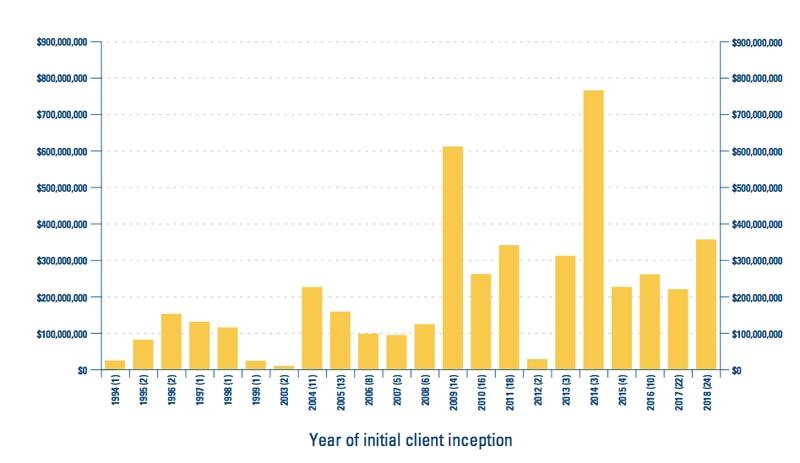 The chart below from CLIG’s 2018 annual report shows market movements (the brown boxes) outweighing the movements from client contributions and withdrawals (the very small yellow boxes). I still applaud CLIG for regularly publishing this template to highlight what could happen. But the ups and downs of client FUM additions and withdrawals — alongside the wider market movements — have shown the numbers to be rather optimistic at times. You can see the optimism for yourself in the template chart above, with the red dotted lines indicating the previous quarterly profit projections. 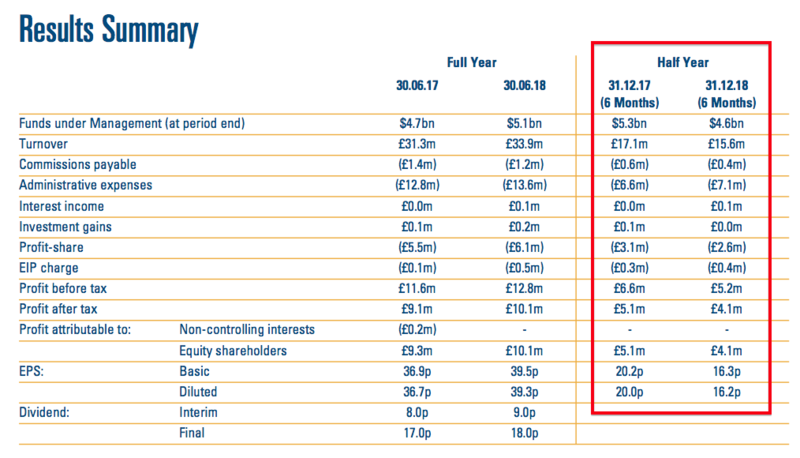 The projection then for 2018/19 was for quarterly earnings of at least £2.5m. The latest template anticipates quarterly earnings at the £2.0m mark. Anyway, CLIG now believes earnings of £1.2m could be retained during the current 2019 financial year. I calculate £1.2m transferred to reserves after repeating last year’s 27p per share dividend means earnings could be approximately 32p per share. CLIG’s first projection for 2019/2020 is a further $100m target increase. I see overheads for the current 2018/19 year are now set to advance 4% rather than 3% on the year before. At least overheads are not expected to increase for 2019/2020. I also note the (awful) Employee Incentive Plan (EIP) is now projected to pinch 5% of this year’s operating profit instead of 4%. I am pleased my valuation sums have always assumed the EIP would skim the maximum 5%. “January’s table had indicated CLIG would earn net fees at 82 basis points on client money. Last July’s table had indicated the rate was 84 basis points, while the rate was 86 basis points the year before. The drop to 77 basis points was revealed initially within the first-quarter update. I understand the lower fee rates are due to lower charges on the non-Emerging Market products. These funds represented 13% of total FUM this time last year, and now represent 19%. As I have mentioned, the EIP charge has been lifted to 5%, too. These H1 summary accounts did not show anything untoward. Despite the lower profit, the operating margin remained high at 33% — albeit not as high as the 37% achieved throughout 2017 and 2018. CLIG’s cash flow contains some not-insignificant entries concerning the exercise of options and the purchase of shares for the employee benefit trust (EBT). I plan to cover these entries (and similar entries from different shares) within a forthcoming How To Evaluate Blog post on share options. I will look at CLIG’s H1 accounts in more detail when the full interim report is issued next month. 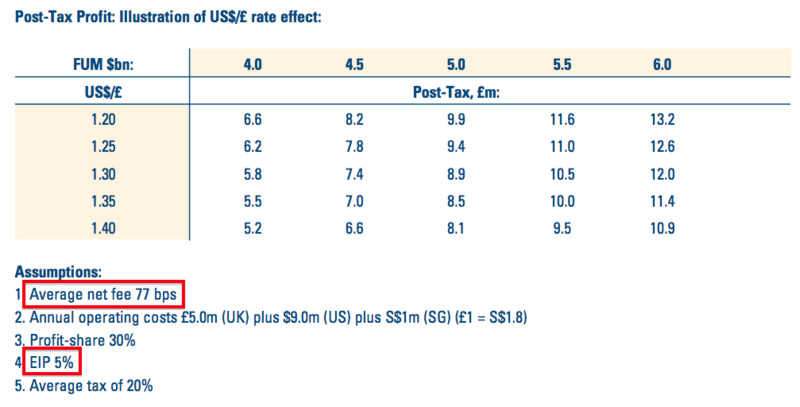 My valuation sums use CLIG’s latest FUM/exchange-rate table (see above). I calculate FUM at $4,625m and GBP:USD at 1.29 may lead to earnings of approximately £7.8m or 29.2p per share. 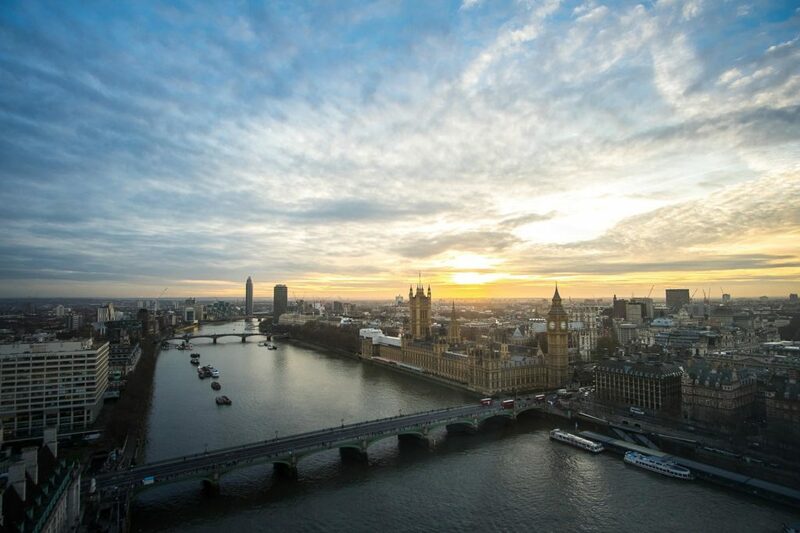 Adjusting the £96m market cap for the cash and investments of £18.9m and regulatory capital of £1.5m, my enterprise value (EV) calculation comes to approximately £79m or 295p per share. Dividing that EV by my earnings guess gives a possible P/E of 10. I should add that my 29.2p per share earnings guess does not leave much room to cover the 27p per share dividend. No wonder the yield is 7.5%. Founder/chief executive Barry Olliff retires at the end of this year and is currently reducing his near-8% shareholding (he last sold during March 2018 at 450p). On the final point, I do wonder whether Mr Olliff’s retirement may spark a new approach to marketing within CLIG. CLIG expects Mr Griffith to be appointed chief executive later this year. While I await some action from Mr Griffith, I am happy to sit back and collect the 27p per share dividend and enjoy the 7.5% income. PS: You can receive my Blog posts through an occasional e-mail newsletter. Click here for details. Disclosure: Maynard owns shares in City of London Investment. This entry was posted in City of London Investment, My Shares and tagged City of London Investment, CLIG on January 18, 2019 by Maynard Paton. Like you I am holding the shares. Thank you for a comprehensive analysis Maynard. It was very interesting. On your last point though the new CEO has been with CLIG for 18 years so I suspect any Vanguard cultural focus may have worn off by now. Good point. I guess I am hoping his earlier marketing background may re-energise CLIG’s marketing efforts in a small way. He is not an investment man, or at least his bio does not suggest he is. 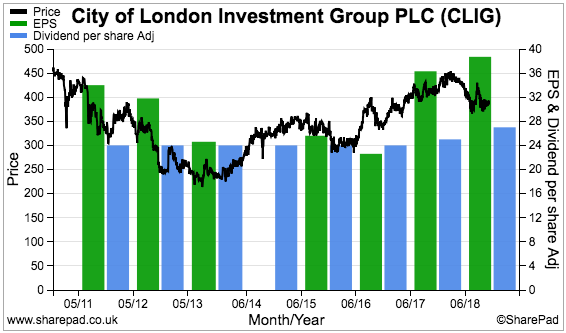 Using the exchange-rate/FUM table shown in the Blog post above, I arrive at earnings of £9.08m or 34.0p per share with client money at $5,072m and £1 buying $1.30. CLIG has followed up the January summary results reviewed in the Blog post above with the full interim report. The statement announced a special dividend and contained a few interesting snippets. I wonder if the special payout ties in with the forthcoming retirement of chief executive Barry Olliff, who still owns 7-8% of the company. Mr Olliff will be dependent on his successors deciding his dividend income from 2020, so he might as well extract what he can while he remains in charge. Bold stuff. The mid-point is a total share-price return of 10% per annum for five years. That said, the current dividend yield is 27p/400p = 6.75%, so not much is needed to reach the minimum 7.5% per annum goal. 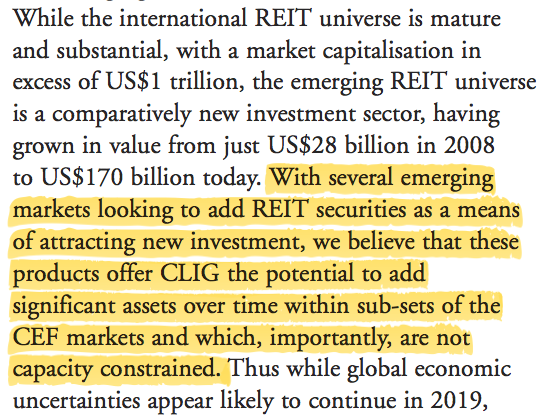 I presume targeting double the total return of that Emerging Market index refers to CLIG’s funds under management and not the share price. A counter-balancing adjustment has been made with the change in debtors entry within the same statement. Nothing too sensational here, with the changes representing 7% (2015), 3% (2016), (7%) (2017), 4% (2018) and 1% (H1 2019) of the prior-year’s year-end FuM level. CLIG has not amended the helpful dividend templates and FuM/FX table from January’s summary results, so my valuation sums remain as per the Comment above. Using the exchange-rate/FUM table shown in the Blog post above, I arrive at earnings of £9.64m or 36.1p per share with client money at $5,275m and £1 buying $1.30.